Schedule your farm visit - come and see the "pacas" up close! 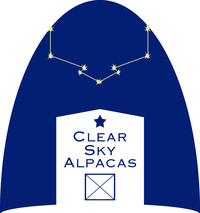 Clear Sky Alpacas, LLC began with a desire to raise animals that would provide the opportunity to work with the fiber arts, to show, to research, and carefully breed to improve the fiber characteristics and conformation of our foundation. Our knowledge in proper conformation and movement was learned while raising and showing our Papillons. This knowledge and our research of fiber was helpful in our choosing our foundation herd of 4 bred females. Our desire became a reality when we moved from Grand Rapids to Carson City, MI in the early part of 2010 so we could care for Kathy's Dad. We readied the farm by installing no climb fencing around the perimeter of the 5 acres set aside for the alpaca and soon after they arrived. Then the cria arrived and our journey in alpacas was taking off. In 2012 our journey found us relocating after the death of Kathy's dad. We are now located on a beautiful farm outside Ionia, Michigan. Since the first group of girls arrived, we have continued to add to our herd. We searched for alpaca with excellent genetic lines that provided traits of great conformation, excellent fiber characteristics, ease in reproducing, and wonderful temperaments. The cria that arrived in 2012 were the first generation born from our personal breeding decisions. They are a group of "knock-outs"! As a full service farm, you will find alpacas for sale, room for boarding, breeding opportunities, and mentoring for our clients. In addition to the alpaca, we also offer a variety of fiber arts opportunities. The fleece that is shorn from our alpaca each year is for sale as raw fiber, washed, skirted, hand dyed, or carded into batts. It can be hand or mill spun into yarn for knitting, crocheting, or weaving. Those that enjoy felting can find an assortment of alpaca fiber ready for your next project. Or are you a fly fisherman? Our alpaca fiber has been used for fly tying too. We enjoy attending markets and fairs to sell our fiber and finished goods. Gardeners, we have soil enhancer available for purchase too. Alpaca poo is wonderful to put onto your flowers and shrubs as it is "not hot". That's right, just put it directly on your plants and watch them take off! We provide scheduled tours for groups of all ages here at the farm and will also come to your organization to talk about alpacas, their care, and the potential tax advantages they could provide.